Casa Alta gets its name because it is situated high off the street just off of millionaire row. The house is one of Granada’s premier properties and gives you such a warm comfortable feeling that you will never want to leave. Casa Alta is located only five blocks from the central park in a very quiet neighborhood. Upon entering the house, you find yourself in a large living area with ample seating, beautiful antiques and art pieces. 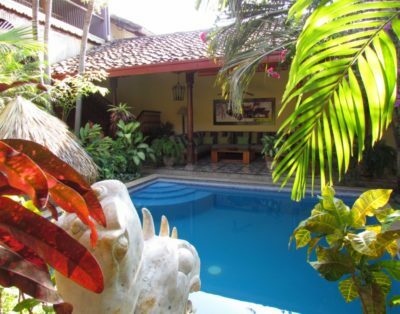 Casa Alta boasts art and furnishings from Bali, Guatemala, Africa and many more places on the globe. The main corridor opens up to a comfortable seating area as well as a nice office niche. The kitchen is fully furnished and very large to give you lots of space to work. There is also a large table for six in the kitchen, the heart of the home. 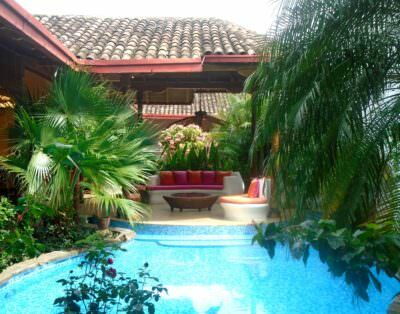 In the center of Casa Alta, you will find a beautiful swimming pool and garden area. 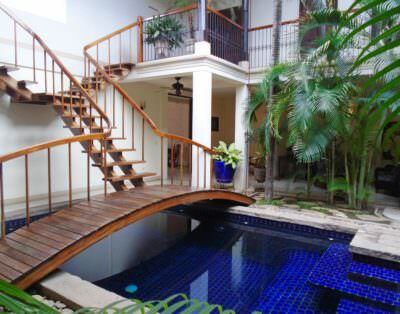 Off the swimming pool corridor, there are three bedrooms. The first has a queen bed, shared bath, air conditioning and ceiling fan. The second has a private bath, air conditioning and ceiling fan. The third bedroom is the master which is large and airy with a king bed. There is a beautiful full bath, air conditioning, sitting area with TV and ceiling fans. One of the most unusual features about Casa Alta is the large screened-in porch at the back of the house, just off the master bedroom. This is a great place to relax with your family and friends and enjoy the cool Mombacho breezes. The porch has ceiling fans and will sleep four additional guests. Casa Alta is the perfect home away from home for you, your family and friends.